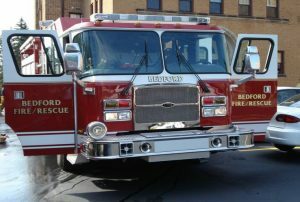 The firefighters of the Bedford Fire Department provide the citizens, businesses and visitors of Bedford with fire suppression and protection, rescue and emergency medical services. Fire suppression and rescue is accomplished through the effective use of personnel, specialized training and equipment. Fire officers receive extensive training in strategy and tactics, fire scene management and incident command. Firefighters are continuously training and updating firefighting skills (fire attack, search and rescue, forcible entry, ventilation, etc. ), vehicle extrication techniques and specialized rescue skills. The rescue pumper responds to emergencies involving motor vehicle accidents which may require extrication and vehicle stabilization. Through aggressive mutual aid agreements the fire department may also utilize the resources of neighboring fire departments in the event of larger incidents. The department has the ability to activate regional specialized/technical rescue teams. The Chagrin/Southeast Hazardous Materials Response Team (HAZMAT), the Hillcrest Technical Rescue Team (HTRT) and the Heights Area Rescue Team (HASRT) can be activated should the department require assistance in emergencies involving hazardous materials, swift water, confined space or trench collapse. Rescue Squads are staffed with a minimum of one, the majority of time, two paramedics. Eighty five percent of the firefighters of the Bedford Fire Department are State of Ohio Certified Paramedics. The remaining firefighters are trained to at least the EMT Basic Level with a majority of those individuals trained to the EMT Advanced Level. Paramedics provide advanced life support through the use of medications, IV’s, oxygen, electrical defibrillation, heart monitoring and other methods. Two fully equipped rescue squads respond to various medical emergencies and injuries. The variety of emergency calls range from a simple laceration or delivery of a baby, to a cardiac arrest or severe trauma patient. This variety of requests for service requires the paramedics to utilize all of their skills. Due to the wide range and unpredictable nature of emergency situations, a state of readiness, accompanied with continuous training and review of practical skills is necessary. The paramedic has the responsibility of mastering a variety of complex skills which include; intravenous cannulation, endotrachial intubation, recognition and management of cardiac dysrhythmias, and administration of drugs and intravenous fluids. Continuing competence in all areas is absolutely necessary.